How's My Patreon Bitcoin and CryptoCurrency Gig Going? Is Bitcoin A Bubble At $8,000? How About At $1 Million, $10, Or even $100 Million? How’s My Patreon Bitcoin and CryptoCurrency Gig Going? I initiated this portfolio only September 2, about a week in advance of initiating my Patreon gig, and in that time since the first post, September 2, that’s how it’s done and what’s remarkable is that more than half of the $2,815 invested has been done over the last 30 days and it’s still up 17% overall. Hasn’t been below 15% overall gains in days. We’re looking at a rate of 200% gains annually. I did this primarily because I wanted to walk the talk. 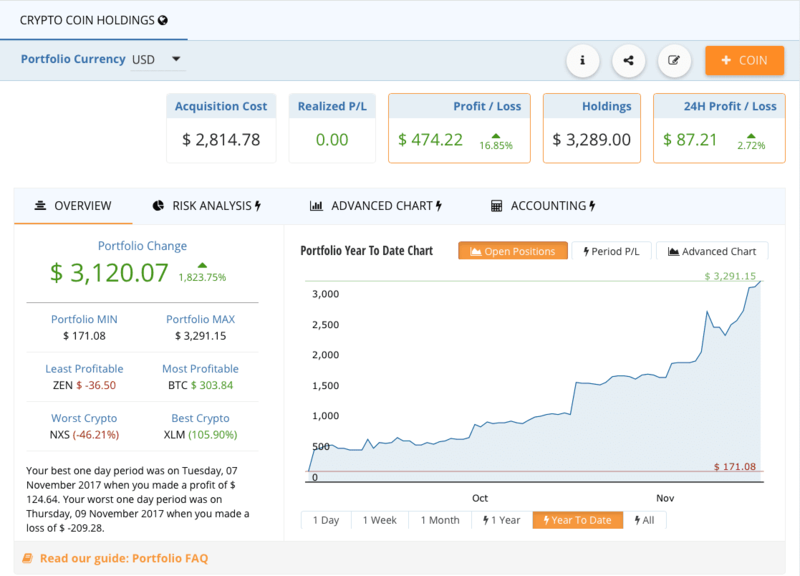 Forever in the investment world I’ve seen various recommendations and sample portfolios—never the dude’s actual and real portfolio and I have it such that any Patron can simply click in and see it going in real-time 24/7. And here’s the other deal: I do own Bitcoin and it’s about 1/3 of total holdings. The other 2/3 is distributed amongst 32 other cryptocurrencies, the best one right now, up 104% and the worst one, down 45%, with everything in between. People everywhere are beginning to see this as something they may regret later if they don’t get going now, soon now. …And that in itself is not a bad gig; like it’s found money. All I needed to do was take what I was doing anyway and do what I always do anyway, which is craft stuff into written word and post it. And here’s the result. You only get to see the actual investments and how to do this by getting up off the couch and getting into it and I do believe that if you’re serious, my deal for a measly $5 per month is a great way to get up and going. Here’s the track record, the name of each ‘coin’ omitted. Curious about Bitcoin and the cryptocurrency phenomenon? Then check out my Patreon Profile.